In 1813, French geologist Alexandre Brongniart published a paper on the mineralogical classification of rocks where he introduced the new name “ophiolite” for a suite of dark rocks rich in the mineral serpentine. The name was coined from the Greek words for “snake” and “rock,” which seemed fitting, given the smooth dark green appearance of ophiolites, vaguely reminiscent of snake-skin (Fig. 1). Fig. 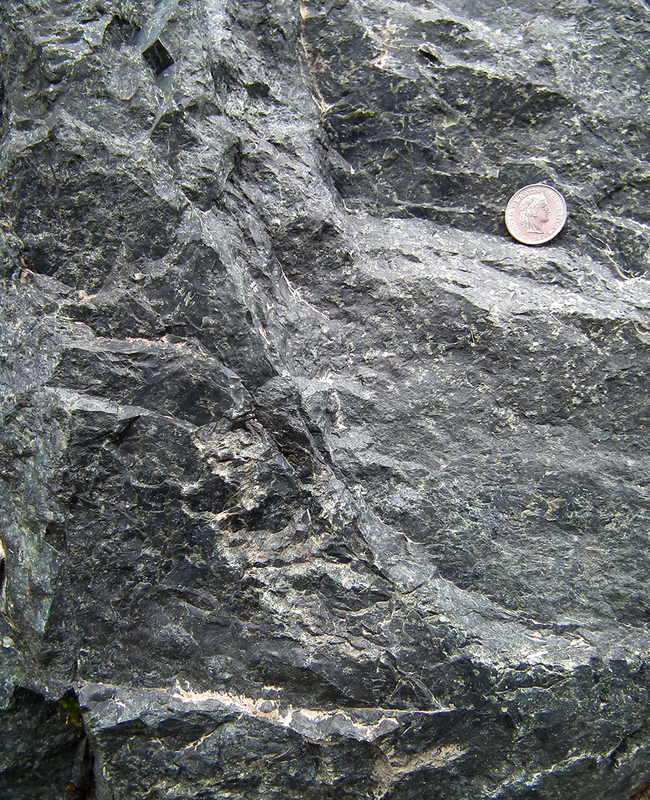 1: Close-up view of serpentinite (a component of ophiolitic rocks). Coin for scale is 1 cm in size. Totalp ophiolitic nappe, Parsennfurga, Switzerland. European geologists throughout the 19th and early 20th century were relatively well acquainted with these dark rocks, first identified in several parts of the Apenninic and Alpine mountain chains but also occurring in other regions of the world. Ophiolites were generally interpreted as igneous rocks, forming from the solidification and differentiation of magma or from volcanic effusions. While studying ophiolites in the early 1900s, German geologist Gustav Steinmann made some important observations that contributed to a better understanding of the origin of these rocks. Steinmann noticed that ophiolites were consistently in contact with layered strata made of limestone, clay, and chert, a silica-rich rock. Sediments of similar composition (lime, clay, and silica ooze) had been recently retrieved from the deep seafloor, during the earliest oceanographic expeditions. Steinmann was aware of this, and he became convinced that ophiolites and the associated sediments must have formed on the deep ocean floor. If this was true, however, why were rocks from the deep ocean floor occurring several kilometers above sea level in the middle of the Alps? This was puzzling because, at the time, continents and oceans were thought to have remained in a fixed position since their original formation. At the most, it was believed, only continents’ edges could fold to form a narrow oceanic depression, called “geosyncline”. Perhaps, alpine ophiolites were remnants of a geosyncline separating Africa from Europe (Fig. 2). Developing this idea, the Swiss geologist Émile Argand was the first to suggest that a large collision between the drifting continents of Africa and Eurasia had trapped and uplifted the deep rocks of the intervening geosyncline, a model that became a clear precursor to the modern theory of plate tectonics. Fig. 2: An Illustration of the geoscyncline separating Europe (left) from Africa (right). Ophiolites are represented as black lensoidal instrusions of magma in the geosyncline. Fiigure published in 1924, in the book of R. Staub, "Bou der Alpen." However, It would take 40 more years to develop a fuller understanding of the riddle of Alpine ophiolites. In the 1960s, a wealth of new information from the study of oceanic floors revealed that, in the Earth’s past, oceans had been dynamically created instead of being fixed and permanent. It was discovered that the composition and structure of the oceanic crust was very similar to what seen in ophiolitic complexes. The notion of geosynclines at the edges of continents was abandoned and replaced with the concept of plate margins at zones of oceanic subduction and seafloor spreading. Eventually, it became clear that ophiolites were not magmatic intrusions localized in a geosyncline but true slices of oceanic crust trapped in powerful collisions of tectonic plates. The ophiolites found among the alpine peaks bear witness to the tortuous path of discovery and dynamic development of scientific concepts. They also represent a tangible record of mighty forces being at work in the past. In the pages of Scripture, we find an account of the Earth’s surface being affected by God’s powerful action at the creation and at the flood. Even if revelation does not address the subject of ophiolites, experiencing the gigantic plate motions revealed by these rocks generate a distinct impression that an unfathomable power has been active in the history of our planet and will be active again (2 Pt 3:5-7). Bernoulli, D., & Jenkyns, H. C. (2009). Ancient oceans and continental margins of the Alpine‐Mediterranean Tethys: Deciphering clues from Mesozoic pelagic sediments and ophiolites. Sedimentology, v. 56, 149-190. Moores, E. M. (2003). A personal history of the ophiolite concept, in Dilek, Y., and Newcomb, S., eds., Ophiolite concept and the evolution of geological thought: Boulder, CO, Geological Society of America Special Paper 373, 17-29. Brongniart, A. (1813). Essai de classification minéralogique des roches mélangées, Journal des Mines, v. XXXIV, 5-48. Steinmann, G. (2003). Die ophiolithischen Zonen in den mediterranen Kettengebirgen (The ophiolitic zones in the Mediterranean mountain chains). Bernoulli, D., & Friedman, G. M., translators, in Dilek, Y., and Newcomb, S., eds., Ophiolite concept and the evolution of geological thought: Boulder, CO, Geological Society of America Special Paper 373, 77-91. Argand, E. (1916). Sur l'arc des Alpes occidentales. Eclogae Geologicae Helveticae, v.14, 145-191; Argand, E. (1924). Des Alpes et de l'Afrique. Bulletin de la Societe vaudoise des Sciences naturelles, v. 55, 233–236. Hess, H. H. (1962). History of Ocean Basins, In Engel, A.E.J., James, H.L., & Leonard, B.F., eds., Petrologic Studies: A Volume to Honor A.F. Buddington: New York, Geological Society of America, 599-620. Dietz, Robert S. (1963). Alpine serpentines as oceanic rind fragments. Geological Society of America Bulletin, v. 74, 947-952.